Cauliflower or gobhi pakora is one of the best appetizers or side dishes what we crave for whether in parties or simply at regular meals or with tea. 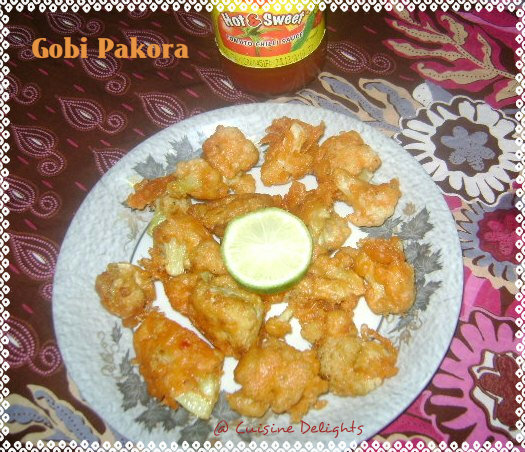 Delicious and hot pakodas made by dipping cauliflower chunks in a batter of besan, rice flour, cornflour with a pinch of various spices. In a large bowl, mix rice flour, besan, salt, turmeric powder, red chilli powder, baking powder together. Heat oil in a pan. 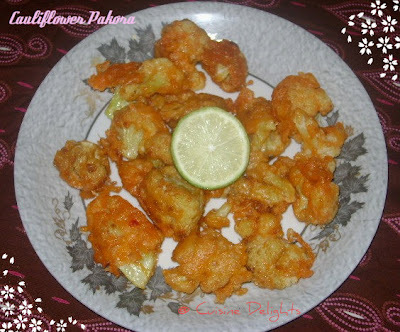 Dip the half boiled cauliflower in the batter and fry them until golden brown. Then add little warm water to the mixture to prepare thick consistency batter and then mix steamed cauliflower florets. Heat sufficient oil for deep-frying. For my pan, I use about 5-6 florets for frying at a time. Let them cook in med-high heat for 2-3 minutes or until golden/reddish brown. Drop them on paper towels to remove excess oil. 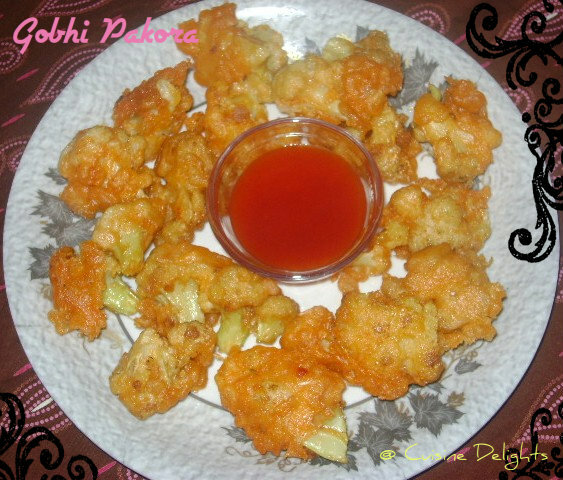 Serve them hot along with Ketchup or any of your favorite chutney.